Following labour market events is key to helping job seekers understand where the opportunities (short, medium and long-term) might be in a local community and elsewhere in the country. The following table offers significant events from past four weeks that may affect the supply and demand in the labour force across Canada. It can prove to be a useful resource to complement your job search and career exploration. 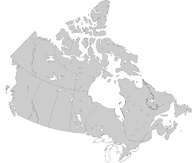 You can explore news items across Canada on this page or refine your search to a specific news event type, sector or region. Download the PDF version (195 KB) of this content. Canadian businesses reported 468,000 job vacancies in the third quarter, up 62,000 (+15.1%) from the third quarter of 2016. The overall job vacancy rate increased 0.3 percentage points to 2.9% in the quarter. The job vacancy rate represents the number of job vacancies expressed as a percentage of labour demand; that is, the sum of all occupied and vacant jobs. Vacancies for permanent positions accounted for 80.2% of all job vacancies in the third quarter, up from 78.5% the same quarter a year earlier. This was the fourth consecutive quarter with year-over-year increases in both the number of job vacancies and the job vacancy rate. As in the second quarter of 2017, year-over-year increases in job vacancies were broadly based across the provinces, industrial sectors and occupations. Compared with the second quarter of 2017, the number of job vacancies (unadjusted for seasonality) in Canada increased by 1.6%, while the job vacancy rate was unchanged, as payroll employment also rose. By comparison, the number of job vacancies declined between the same quarters in 2015 while it had gone up between the same quarters in 2016. Compared with the same quarter a year earlier, the number of job vacancies in the third quarter of 2017 increased in nine provinces, led by Quebec and British Columbia, while job vacancies fell in Newfoundland and Labrador. In the territories, vacancies rose in Yukon, while they were little changed in the Northwest Territories and Nunavut. 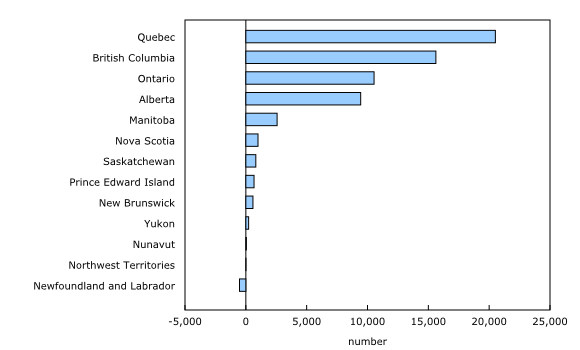 Similar changes were observed for the job vacancy rate across provinces and territories. Employers in Quebec reported 87,000 job vacancies in the third quarter, up 21,000 (+30.6%) from the same quarter a year earlier. At the same time, the job vacancy rate rose by 0.6 percentage points to 2.5%, the largest year-over-year increase for this province since the data became available in 2015. Growth in job vacancies was widespread across sectors, led by manufacturing. Job vacancies increased in all areas, with a notable rise in the economic region (ER) of the Capitale-Nationale, which includes Québec City, followed by Montréal. 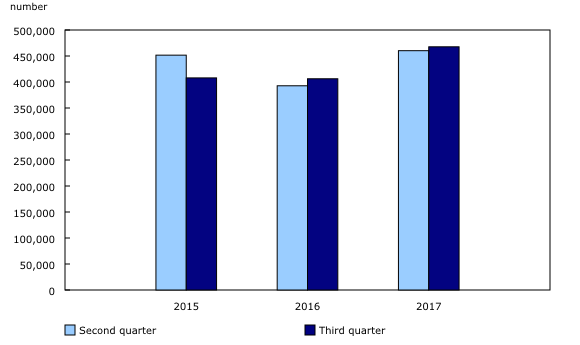 According to the Labour Force Survey (LFS), employment in Quebec grew by 2.2% between the third quarter of 2016 and the third quarter of 2017. This compares with 2.0% growth nationally. At the same time, the unemployment rate fell from 7.0% to 6.0% as fewer people searched for work. Over the same period, the ratio of the number of unemployed to the number of job vacancies declined in Quebec, suggesting a relative tightening of the labour market. In British Columbia, job vacancies continued to increase in the third quarter, rising by 16,000 (+20.2%) on a year-over-year basis. The job vacancy rate also increased to 4.2% in the third quarter, up from 3.6% the same quarter a year earlier and the highest rate in the country. The largest rise in vacancies was in transportation and warehousing, followed by accommodation and food services. British Columbia had the lowest unemployment-to-vacancy ratio among the provinces. There were 11,000 (+6.1%) more vacancies in Ontario in the third quarter compared with the same quarter a year earlier. Over the same period, the job vacancy rate rose by 0.2 percentage points to 3.0%. Job vacancies rose notably in health care and social assistance as well as in manufacturing. In contrast, vacancies fell in professional, scientific and technical services. Within the province, job vacancies increased the most in the ERs of Hamilton¿Niagara Peninsula and Kitchener¿Waterloo¿Barrie. Job vacancies in Toronto were little changed following four consecutive quarters of year-over-year increases. The number of job vacancies in Alberta rose by 9,400 (+21.3%) in the third quarter and the job vacancy rate was up by 0.4 percentage points on a year-over-year basis to 2.7%. The number of job vacancies went up in a majority of the 20 industrial sectors, with the largest increases in construction, transportation and warehousing, as well as in mining, quarrying, and oil and gas extraction. Job vacancies rose throughout the province, except in the economic region of Edmonton, where they were little changed. Employers in Newfoundland and Labrador reported 500 (-12.9%) fewer vacancies in the third quarter compared with the same quarter a year earlier. At the same time, the job vacancy rate declined by 0.3 percentage points to 1.6%, the lowest rate in the country. Over the same period, the LFS showed that the unemployment rate rose from 13.0% to 15.2%. Job vacancies decreased in several sectors, including health care and social assistance. 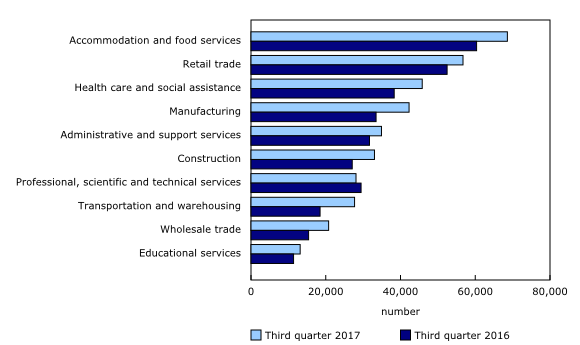 In the third quarter, the number of job vacancies was up in 7 of the 10 broad occupational categories on a year-over-year basis, led by trades, transport and equipment operators, and sales and service occupations. These occupational groups were also the two largest broad occupational categories in terms of vacancies. Over the same period, job vacancies in management occupations declined while they were little changed in business, finance and administration occupations and occupations in art, culture, recreation and sport. Job vacancies in trades, transport and equipment operators were up by 24,000 (+41.0%) year over year, with one-third of the increase reflecting more vacancies in motor vehicle and transit drivers. The above-average growth in vacancies in this broad occupational category helped raise its share of national vacancies to 17.9% in the third quarter compared with 14.6% in the third quarter of 2016. Within sales and service occupations, the largest increase was in food counter attendants, kitchen helpers and related support occupations (+20,000 or +13.5%). The number of job vacancies in the third quarter rose in 9 of the 10 largest industrial sectors in terms of employment, led by transportation and warehousing, manufacturing and accommodation and food services. At the same time, job vacancies were little changed in professional, scientific and technical services. On a year-over-year basis, transportation and warehousing was up by 9,200 (+50.0%) in the third quarter, in line with the rise of vacancies for motor vehicle and transit drivers. 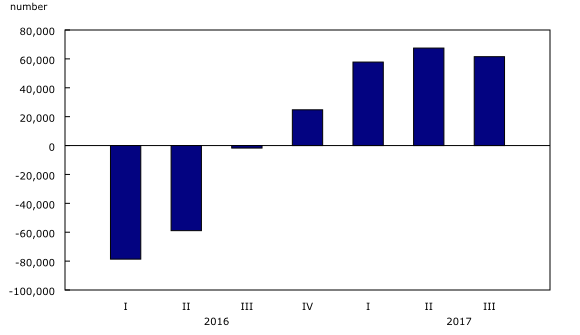 Job vacancies in manufacturing rose by 8,800 (+26.4%) in the third quarter, with about half of the increase concentrated in Quebec. The increase in vacancies in manufacturing was consistent with a recent upward trend in the national real gross domestic product for this sector. Job vacancies were up notably in accommodation and food services (+8,200 or +13.6%), and the majority of the increase was the result of a rise in vacancies in food services and drinking places. 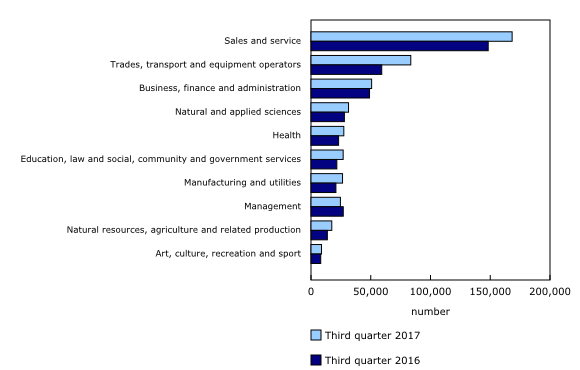 The accommodation and food services sector continued to have the highest job vacancy rate among the large sectors at 4.8%, likely reflecting relatively higher turnover. Most of the smaller sectors (in terms of employment) also registered increases in the number of vacancies. Among these, the mining, quarrying, and oil and gas extraction sector (+3,000 or +128.2%) had a marked rise, with about half of the increase concentrated in Alberta. Nationally, the average offered hourly wage in the third quarter was little changed at $19.85. However, larger changes were observed across broad occupational categories, particularly in natural resources, agriculture and related production occupations, where the offered wage grew by 11.5%. Changes in the average offered hourly wage for job vacancies can reflect a variety of factors, including wage growth and changes in the composition of job vacancies by occupation, by sector and between part- and full-time positions. For example, the 11.5% increase of the offered wage in natural resources, agriculture and related production occupations was partly driven by the rise in the number of job vacancies for higher-paying occupations, such as mine service workers and operators in oil and gas drilling, as well as underground miners and oil and gas drillers. To view more news items, please select a Province or Territory from the top menu. COPS projections allow for identifying those occupations that are likely to face shortage or surplus of workers over the medium term. Users can search for occupational summaries, more detailed data and technical documents on the results or the methodology used to do the projections. The National Occupational Classification is being updated. To propose a change, please visit ESDC to submit proposals.